Common belief around SEO is that if you’re not using keywords in the copy of your website, you’re putting your site at a disadvantage. While this still holds true, there needs to be more than just keywords. In addition to keywords, content that speaks to customers and not just for search engines will win. One of the old ways of doing SEO was to stuff a bunch of keywords onto a webpage. It didn’t matter if the keywords were relevant to a website or not. Content marketing strategies in 2014 will be focused heavily on providing quality content for a unique user experience. “Ideally you’d have good content that people share,” says Kyle Coia, SEO Specialist at Design and Promote. While sites are becoming more visual, you can’t exclude having text on a webpage: “You have to have words on it because Google can’t read your beautiful pictures…have relevant things for Google to read,” Coia says. Content that aims to attract your target audience will be in sync with keywords and interesting content. “We used to rank our website by just using backlinks,” says Bruce Jones, CEO of Design and Promote. But backlinks alone cannot increase rankings. 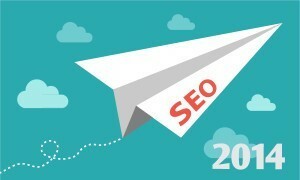 For search engine optimization in 2014, the only backlinks that will count are the ones coming from your niche audience. With this approach, backlinks act like votes that support keywords that you have in your website content. In fact, random backlinks no longer count as a positive strategy; they have a negative impact on a site’s ranking in search results. For instance, Google penalizes link schemes or automated programs that create links to your site. To read more on the best way to build backlinks click here. To fully gain the benefits of social media in 2014, we will see SEO and social strategies become more integrated. And having a good following on social media is important. “Google started following social media links in 2010, it counts those as SEO power,” says Jones. For instance, posts that get retweeted (RT) and shared on Twitter can impact a site’s ranking in search results. Although it is still hard to tell if social media likes directly correlate with search rankings, the driving factors for higher rankings are still links and quality content. Note: Google can only crawl social media profiles, pages and posts that are public. The best way to build a social media strategy is to build a community on social and seek to nurture that community of fans, clients and leads. One way to have shareable content for social media is to blog. “Google is going to look more favorably on a website with a blog that has 100 pages than an old fashioned business website with only 5 pages,” says Jones. Blogs that provide users with interesting and informative information will help keep your audience engaged. We recommend WordPress as a great blog platform to use. For a lot of people, it took a while to warm up to the idea of using Google +. But actually being active on Google + is going to be huge for 2014. “Google is rewarding the people on Google +, with improved rankings,” says Jones. So, the best thing for any content creator is to have a personal Google + page that is tied to their content. Be sure to link your Google+ page with your blog and website. Check out this blog post on setting up Google Authorship. Since Google owns over half of the American search market; surely, SEO power will be boosted for content that is connected to a Google Authorship page. Responsive design is a way to optimize your site for mobile. With the dramatic increase of users logging into social media, reading emails and tweeting from a mobile phone, responsive design will be a key area to focus on for 2014. There is a difference between a mobile site and a website that is responsive. “With responsive design you have one code and do SEO for one website,” says Brent Tyson, Lead Web Developer at Design & Promote. A mobile site is treated as a second website; you’ll have to build SEO for that site too. He says that you’re doubling your SEO efforts, by having two sites. But with responsive design, it will read your device’s specific resolution and adjust so that content looks different on a mobile, tablet or a desktop. As we all begin to close out the year 2013, may 2014 be full of new and exciting possibilities for you and your business! For help with adjusting your strategy for 2014, please contact us!